Miscommunication issue can occur due to technical reasons in a variety of situations, such as when talking on the phone in an area with bad reception or with a lot of background noise. This is especially frustrating if you’re trying to communicate an exact term, such as a name or a street address. The NATO phonetic alphabet is a way of spelling out words by using easy to understand codewords, each of which signifies a single letter in the English alphabet. 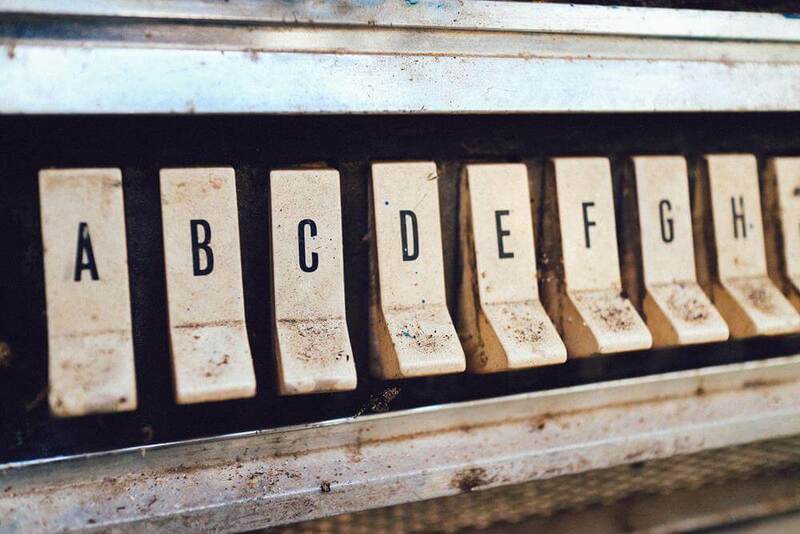 Using the NATO phonetic alphabet can help you avoid miscommunication issues, by allowing you spell out words in a way that is intelligible to listeners regardless of the situation. This can be valuable for anything from talking with tech support, to giving critical information to emergency services. In fact, the NATO alphabet is so effective that there have been calls for using it among medical professionals, where accurate communication can be a matter of life and death. The following guide will explain to you how the NATO alphabet works, and how to use it. The concept behind it is very simple, so you will be able to implement it almost immediately and with good results. While learning the actual NATO alphabet can be useful, the most important thing is to remember how the different letters are represented. By simply remembering this one principle, you can enjoy most of the benefits of the NATO alphabet, without much effort on your part. Furthermore, this principle is useful in locations where people use different types of phonetic alphabets, such as the LAPD radio alphabet, as most of these alphabets rely on the same principle. First of all, the NATO alphabet is the universal standard for phonetic alphabets in many areas in the world, meaning that a lot of people, and especially those who encounter it in a professional setting, are likely to recognize and understand it. Second, the specific words in the NATO phonetic alphabet were chosen based on extensive testing, as they ensure mutual intelligibility between speakers from different linguistic backgrounds, by being easy to pronounce and to recognize. 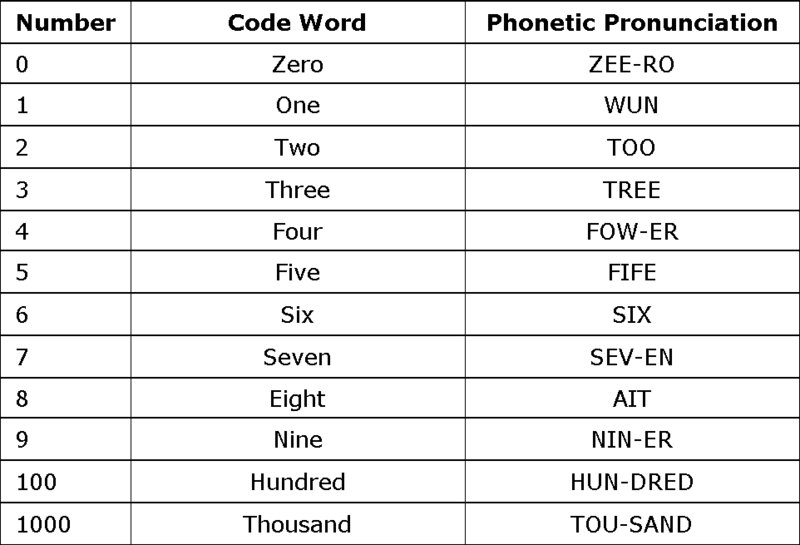 In the image below, you can see the full NATO phonetic alphabet, which shows which letter each codeword signifies, together with the official phonetic pronunciation of that codeword. In the NATO alphabet, punctuation marks are referred to by their name, with a few exceptions: a hyphen (-) is referred to as a dash, a period (.) is referred to as a stop, and a decimal point is referred to as a point or as a decimal. 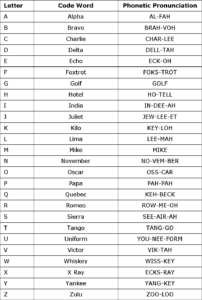 Note: if you would like a full table of the NATO phonetic alphabet, which contains both the letters and the numbers, you can view it in the following links either as an image or as a PDF. If you decide you want to memorize the NATO phonetic alphabet, you can do it through a variety of methods, including by using handmade flashcards, or by using a memorization software (such as Anki). You could also choose to simply memorize the codewords in order, using a simple list of the NATO phonetic alphabet, which you can combine with a certain rhythm or tune that makes the codewords easier for you to remember. If you’re struggling to remember specific codewords, try to associate them with what they represent. For example, if you struggle to remember that the codeword for the letter “W” is “Whiskey”, try to not just focus on memorizing the codeword itself, but also on remembering a relevant image that is associated with it, such as a bottle of whiskey. Once you can roughly recall all the codewords, start practicing the use of the alphabet by spelling out various words with it. These words can be anything you want: from random items you see, to the addresses of streets that you pass. Since the NATO alphabet doesn’t contain too many items, and since it’s relatively intuitive by design, it should be relatively easy to memorize it with some practice. Furthermore, since you can always improvise if necessary, by replacing the original codeword for a letter with a similar word that starts with the same letter, you shouldn’t worry too much if you can’t reach 100% accuracy. In some cases, you can benefit from saying the full word that you are spelling out. Doing this before spelling out the word can help the person that you are talking to figure out what you are trying to say early on, while saying it after you finish spelling it out can help ensure that they understood what you are trying to say. Make sure that the person you’re talking to knows that you are spelling out a word using the NATO phonetic alphabet. If they’re not familiar with the concept of the phonetic alphabet, you can use the following pattern of speech when spelling out words: “N as in November, O as in Oscar…”, which most people will intuitively understand. Avoid using words that can be easily confused with other words due to a similar-sounding initial letter (e.g. Ban/Pan). Avoid using words which contain an initial letter that is difficult to isolate (e.g. the ‘T’ in ‘Trail’, which is pronounced together with the ‘R’). Pick a medium-length word, with about two syllables (e.g. ‘Oscar’, which is pronounced OS-CAR). If the letter that you are trying to spell out is a consonant, then the letter which follows it should be a vowel; for example, in ‘Kilo’, the ‘K’ is followed by an ‘I’. Conversely, if the letter that you are trying to spell out is a vowel, then the letter which follows it should be a consonant; for example, in ‘Alpha’, the ‘A’ is followed by an ‘L’. This ties back to the earlier guideline, which suggests that you should avoid words where the sound of the initial letter is difficult to isolate. While this might sound complex, you shouldn’t worry about it too much, since most people tend to intuitively pick relatively good words, and since it’s okay to pick a word that isn’t perfect. ‘Bravo’, for example, is used in the NATO alphabet despite the fact that the ‘B’ is pronounced together with the ‘R’. This was found to be acceptable, since the word ‘Bravo’ is relatively unique, so people can easily understand that the speaker is referring to it. However, if a word such as ‘Brain’ would have been picked, for example, then this issue would have been compounded by the fact that it could easily be confused with similar-sounding words such as ‘Drain’, ‘Train’, or ‘Grain’. Remember that if you have any doubts as to whether you were properly understood, you can ask the other person to repeat what you said to them after you finish talking. Then, if you notice any miscommunication issues, you can adjust the codewords that you used appropriately, and repeat the problematic parts of your message. There are often miscommunication issues when trying to spell things out through a device such as a phone, a radio, or a microphone; this can be frustrating in some cases, such as when contacting tech support, and outright dangerous in some situations, such as when telling emergency services your location. To solve this, you can learn how to use the NATO phonetic alphabet in order to spell out words to the person that you are talking to. This alphabet contains a list of codewords, each of which corresponds to a specific letter in the English alphabet, so that you use these words in order to spell things out instead of using letters, since the codewords are easier to hear and understand. If you don’t remember the official NATO alphabet, you can improvise by using words where the first letter in the word corresponds to the letter that you are trying to say (e.g. say ‘Adam’ to spell the letter ‘A’). However, if possible you should try to learn the NATO alphabet itself, since its use is standardized, meaning that a lot of people will recognize it relatively easily, and since the words that it contains were chosen in order to ensure intelligibility between speakers. Before you start spelling things out with the phonetic alphabet, make sure that the person you are talking to understands what you are doing. If they are not familiar with the concept of a phonetic alphabet, you can use the following formulation, which most people will intuitively understand: “G as in Golf, M as in Mike…”. If you’re improvising a phonetic alphabet, avoid using words which can be easily confused with other words that have a different first letter, or words where the sound of the first letter is difficult to identify. In addition, you can often benefit from saying the full word that you are spelling out, either before or after you spell it.